← How Lucky Are You? I’m a little old for First Communion, but it was a powerful experience, so I’m sharing it. Here’s how it happened. One Sunday in December, I attended the annual conference of Friends of Sabeel, a Christian coalition supporting Palestinian rights. It was held at St. John’s Presbyterian, a gorgeous church in San Francisco with beautiful stained-glass windows and an arching cathedral ceiling. The meeting was preceded by the church’s religious service. I got there near the end of the service, in time for the Holy Communion, also called the Eucharist. I had heard all my life about communion, but I have never understood it or partaken of it before. Others think communion is a symbol, an affirmation that worshippers are united in Christ. Not really being part of that community, I didn’t know what to think. So, I was surprised when I got the bread and heard her words, and tasted the bread, I felt like a light was shining on me. I understood, without thought, that every time we eat or drink, we are literally eating God’s body, of which the Earth and everything on it, including us, are part. Everything we eat is a gift from God, coming to us from the Sun, through the Earth. The blood sacrifice is real too: for almost everything we eat, someone gave up their life. And all those lives, plant and animal, are part of God, in the same way that we are. That may not be a mainstream Christian belief, but it is central to most Eastern religions and to mystical traditions everywhere. God and the Universe are the same thing. I wonder why we can’t celebrate communion every time we eat, then. According to the Christian website Compelling Truth, The Apostle Paul said to remember Christ every time we eat bread or drink wine, but he also warned against just going through the motions. It should be a proper ceremony. 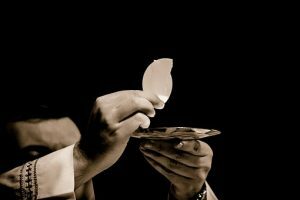 Some Christians believe you can only do communion in a church; or at least with an ordained minister. Most say you have to focus on Christ while you’re tasting the bread. So far, I’m not including others in a ceremony, but I do think of Communion before I start and as much as possible during a meal. I sometimes think, ‘This is what God tastes like.’ Some people might think that’s weird, or even that I’m being blasphemous. It doesn’t feel that way to me; it’s an act of worship. It makes me stop to appreciate food and all our gifts more. I find that preceding each meal, or each bite, with ‘This is the body of Christ’ vastly increases my sense of the gift that food is. It’s not just giving thanks; it’s joining with the food, all of us being part of the same wholeness, with its constant birth and death, killing and being killed. It’s an endless dance, and Communion keeps me in touch with the wonder, grief, and beauty of it all. I don’t know if I’ll return to church, but I probably need to go somewhere. Taking these ceremonies and beliefs away for their contexts and communities is probably missing much of the power of them. I also plan to continue tasting God in my food until the World tells me to stop. Maybe you will, too. This entry was posted in happiness, miracles, Uncategorized and tagged Christ, Communion, food, mysticism, unity. Bookmark the permalink. 5 Responses to What Does God Taste Like? I like your take on communion. I understand the Universe much the same as you. Communion, that is, “Co-union”, is to me a way of remembering who Jesus CHrist is to me, and what He did for me. I will celebrate this until I see my Savior again face to face. The formality of experiencing this in a building is inconsequential, however, it is always a solemn occasion when you realize what Christ did for you and I to be able to partake of this communion. As for every meal, I am thankful that my Creator provides for my needs, and I receive the gift with a grateful heart. Happy New Year, love you dear friend! That is certainly an interesting take on communion but isn’t that why we say “grace” before meals? To elevate the food we are about to eat to the level of spiritual food. Food for our bodies & also for our spirit. Beautiful David! I so love your interpretation of the body and blood of Christ. Thanks for this <3. Beautiful, David! From an ex-Catholic who was excommunicated after a failed, very short marriage when I was 20, I think you got this right.